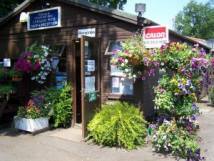 Stanford Hall Caravan Park is a beautiful, tranquil site set in the rural grounds of the Stanford Hall Estate. Whether coming for a peaceful break; a visit to surrounding attractions or to catch up with old friends, you are guaranteed a pleasant stay in the hands of their experienced team. 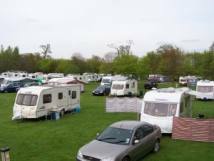 Stanford Hall Caravan Park offers 123 pitches on grass and a number of hard standings all with electric hook up (16 Amp). You can check to see if they have availability here. A limited number of seasonal pitches are also available and rallies can be catered for from a small group of 10 upto 650 units. There is a well stocked site shop offering a wide range of groceries, bread, milk, eggs, butter, bacon, etc. and they also have Walls Ice Cream, a fresh bean-to-cup coffee machine, iced slushy drinks and calor bottled gas. Dogs are welcome and a designated dog walk has been established through part of the Estate Woodland. A number of events take place at Stanford Hall throughout the year including Volkswagen Owners Club Rally, Vintage Motorcycle Club Founders Rally and a Fireworks Competition. In addition the site is within easy reach of the following: NEC Birmingham (30 miles), Stratford upon Avon (35miles), Warwick Castle (25 miles), Rockingham Castle and Althorp. Silverstone, Rugby “Saints” at Northampton or “Tigers” at Leicester are easily accessible. 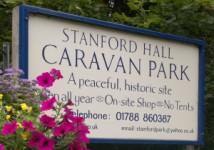 Stanford Hall Caravan Park is an ideal location for walkers and Twitchers with Pitsford Reservoir, Rutland Water and the Grand Union Canal near at hand. Don't just take our word for it, the site has an average review score of 9/10 from UKCampsite.co.uk users! To make a booking or for more information on Park facilities and special offers	visit their website! Win one of 3 weekend stays at Stanford Hall Caravan Park! We have teamed up with Stanford Hall Caravan Park and are giving you the chance to win one of 3 weekend stays. The prize is for up to 4 people and includes electric hookup. Conditions apply: 2 nights from Fri-Sun. Weekends can be taken any time up to 31st July 2014, excluding 1st weekend in August 2013 and 1st May Bank Holiday 2014. To find out more and enter click here - competition now closed!